After a nice relaxing day at the pool (at least for my family since I ran around to numerous resorts instead) we were ready to visit the last theme park on property Hollywood Studios. 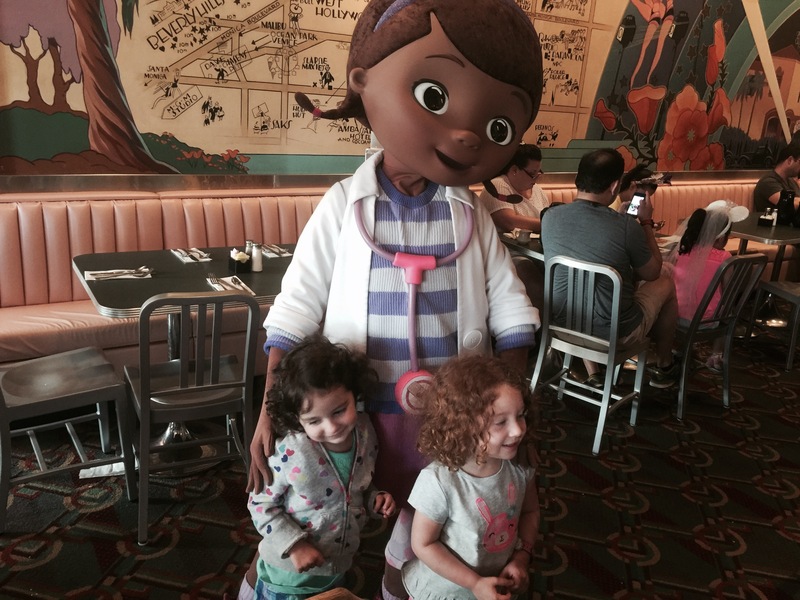 We started the day having a character breakfast at Hollywood & Vine with the Disney Junior Character’s. This was another pretty standard Disney breakfast buffet, but this was one of the few places to see Sofia, Doc McStuffins, Handy Manny and Jake the Pirate. Our kids really liked meeting these characters which wasn’t too much of a surprise since they have only recently started watching the Disney Junior shows on TV. After breakfast we headed back towards Hollywood Boulevard to check out some of the stores. While my family checked out the souvenirs I ran over to Oscar’s Super Service center which is mainly used for stroller and wheelchair rentals but they do have a penny machine located inside. 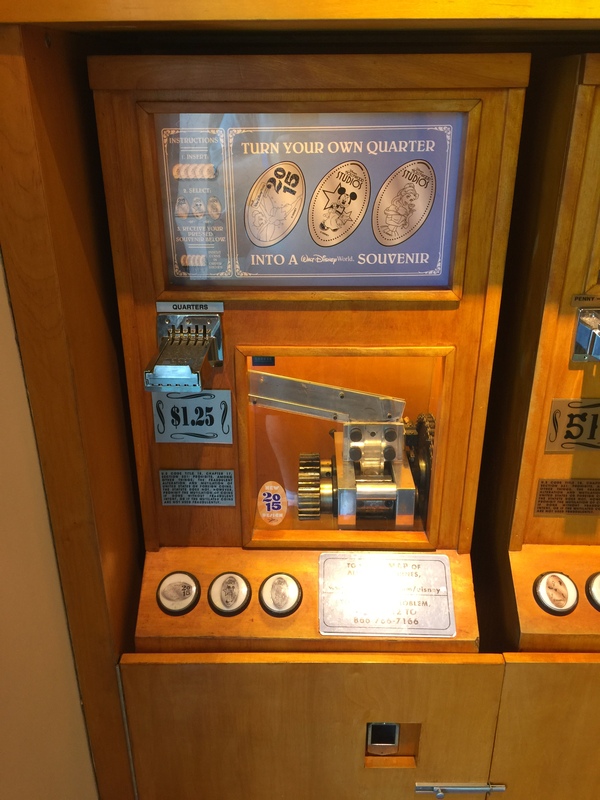 The machine has 3 penny designs: Snow White, the Cheshire Cat, and Aladdin. With these new pennies in my pocket I walked up Hollywood Boulevard and met my family in the Mickey’s of Hollywood store. Lucky for me this place has 3 machines that I needed to used. Machine #1 has 3 quarter designs: 2015 Tinker Bell, Minnie Mouse and Belle. 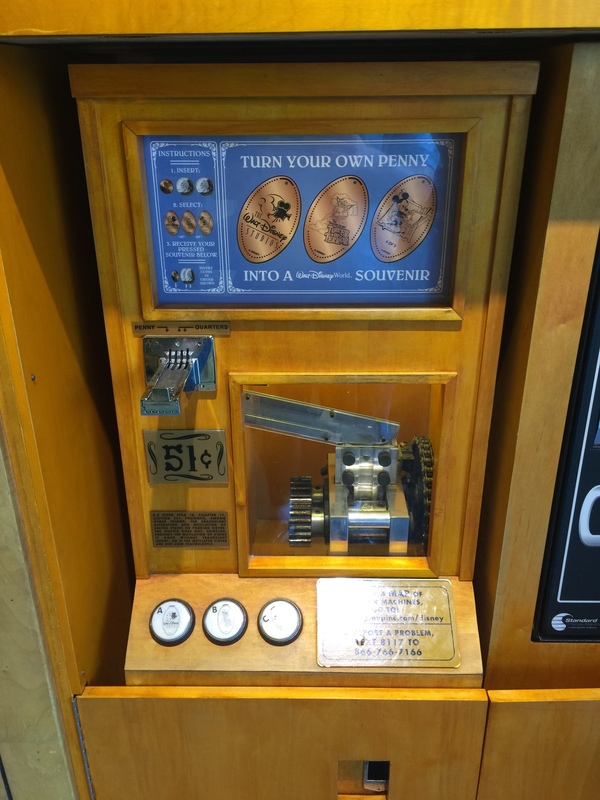 Machine #2 has 3 penny designs: Mr. Incredible, Elastigirl, and Olaf from Frozen. 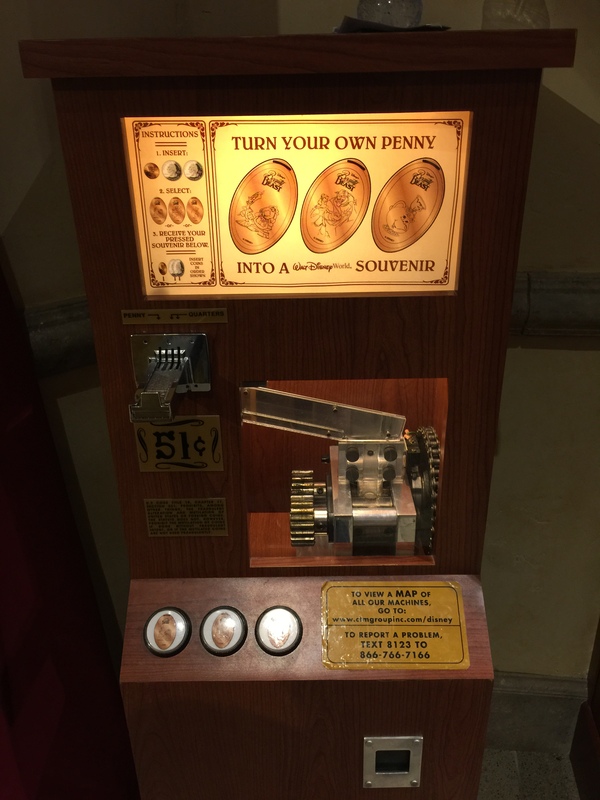 The third machine also has 3 penny designs: Mickey with a Movie Camera, The Tower of Terror, and Mickey at a Drawing Table. After picking up some gifts we headed towards the Disney Animation courtyard and checked out the Disney Junior Love on Stage show. Even though we had just had breakfast with these characters our kids still loved see the puppet show with lots of singing and dancing. After the show we were aiming for The Great Movie Ride but before we left he Animation courtyard we passed by the In Character Shop. 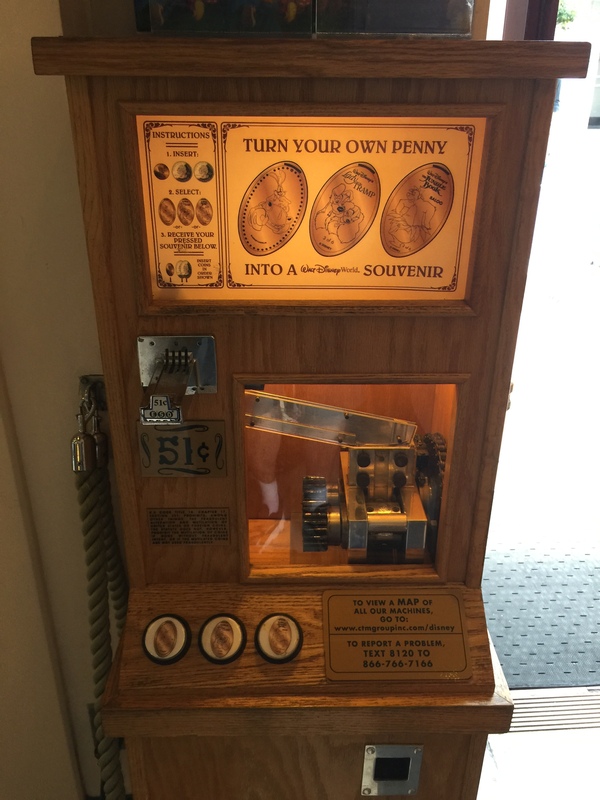 This is the first ever 12 design penny machine and it was really cool. 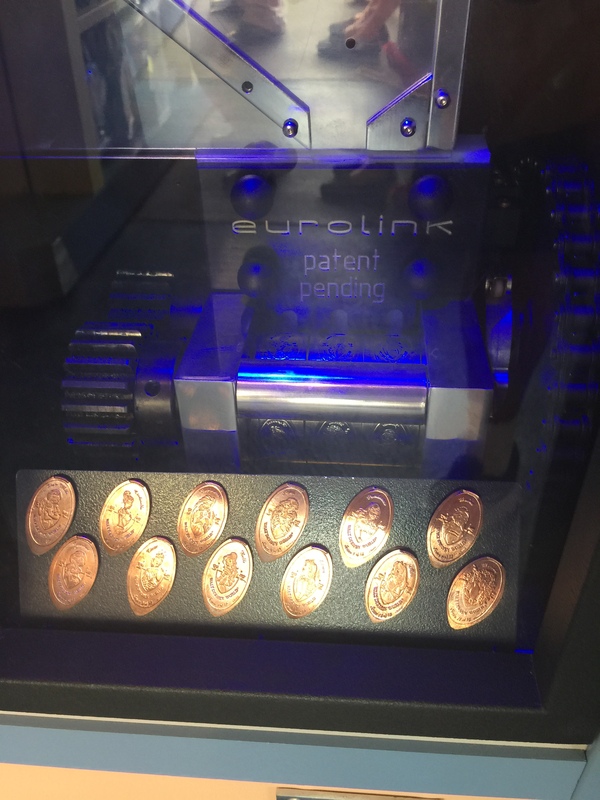 I wrote about this machine in a previous post which you can read by clicking this link. The coins are $1 each, or $10 for all 12. 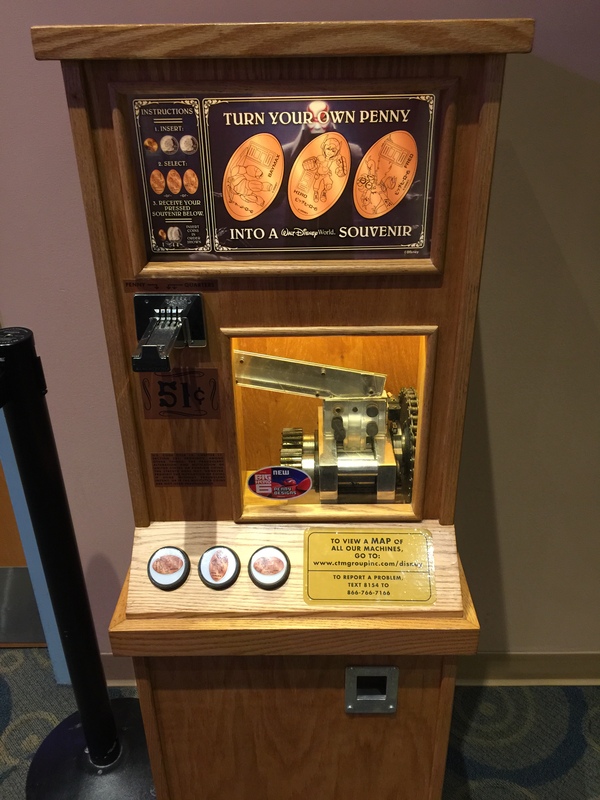 You can use cash, credit or Apple Pay as your form of payment and the machine supplies the coins which isn’t always to your benefit as you may get stuck with a bad penny. The 12 designs available are: Snow White, Cinderella, Rapunzel, Ariel, Pocahontas, Mulan, Jasmine, Tiana, Belle, Aurora, Merida, and Alice. This is really a great complete Princess Set that I would highly recommend. After that machine my pockets were really getting weighed down but there were plenty more to get this day. After we rode the Great Movie Ride we headed to the Muppet Vision 3D Theater and let the kids check out the Stage 1 Company Store that has everything Muppet related you could think of. 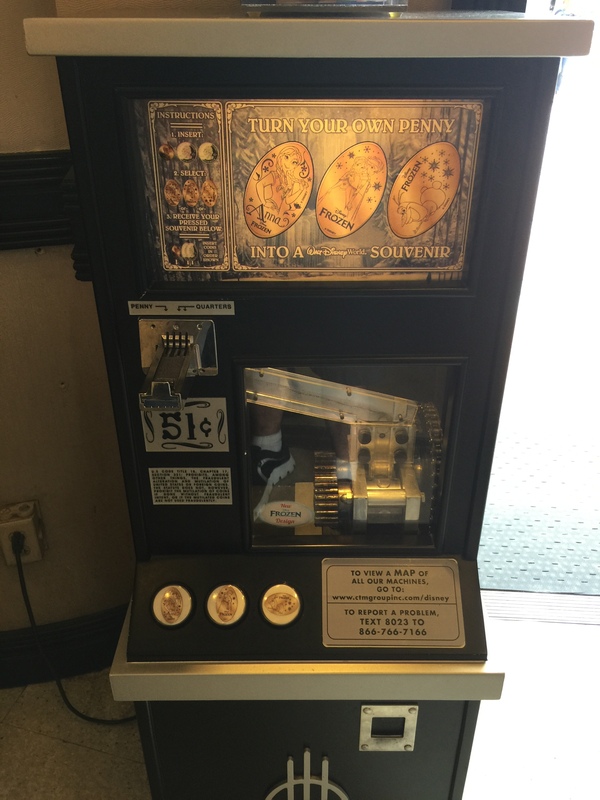 By one of the doors there was penny machine calling my name. As you would expect this machine has Muppet related designs: Kermit the Frog, Fozzie Bear, and Miss Piggy. By this time we could tell the kids were antsy to run around and get some energy out so we walked over towards Honey I Shrunk the Kids play area. As I’m sure you may have guessed they also had a penny machine right outside which I quickly used before we entered the play area. 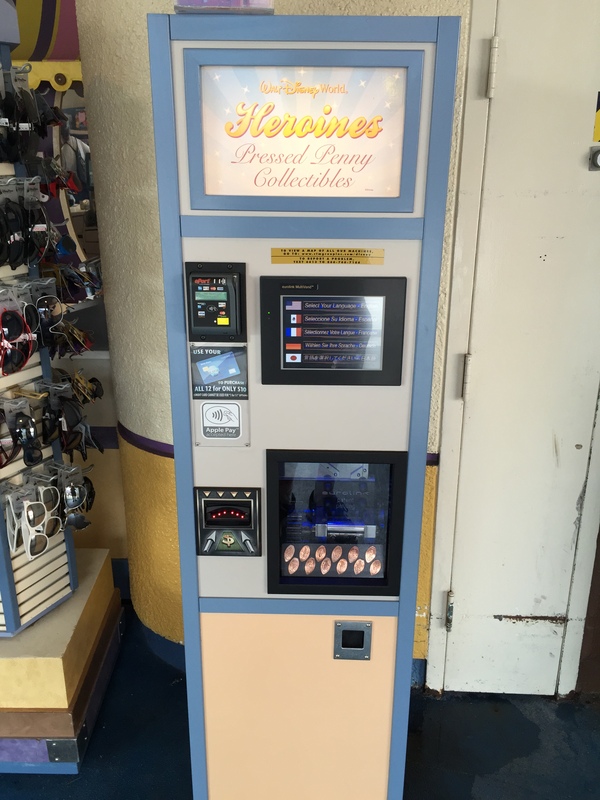 This machine has 4 designs: Iridessa, Flik, Tinker Bell, and Heimlick. Now this is a pretty big play area where everything is giant-sized so it seems like we have all been shrunken down to the size of ants (maybe even a little smaller). The kids had a great time running around and playing on the slides, cargo net (Spider web) and even the leaking hose that sprays water every so often. Once we were ready to be transported back to our original size we headed over to the closest quick service food location which was the Studio Catering Company for a quick break and some much needed drinks. While my family sat and relaxed I walked over to the nearby Prop Shop to use the next 3 machines on my list. 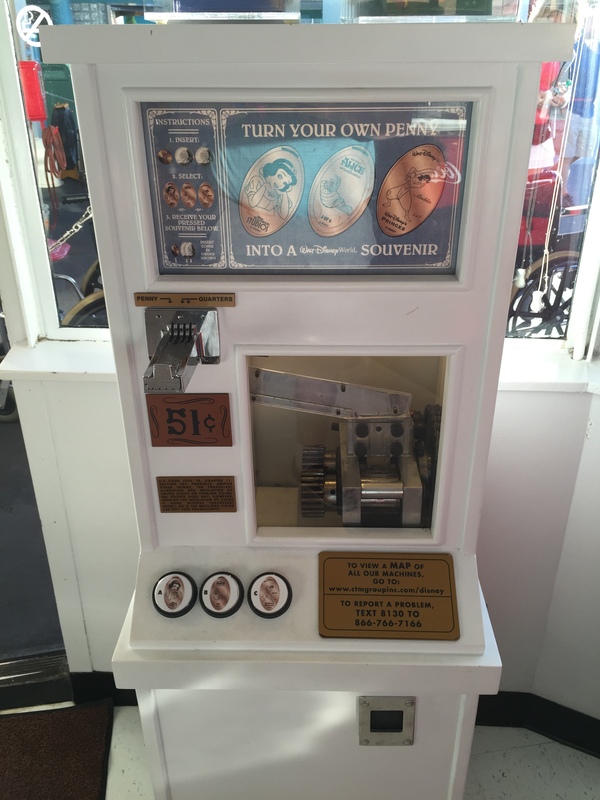 The first machine has the following designs: 2015 Minnie Mouse, Jessica Rabbit, and Jack Jack from The Incredibles. 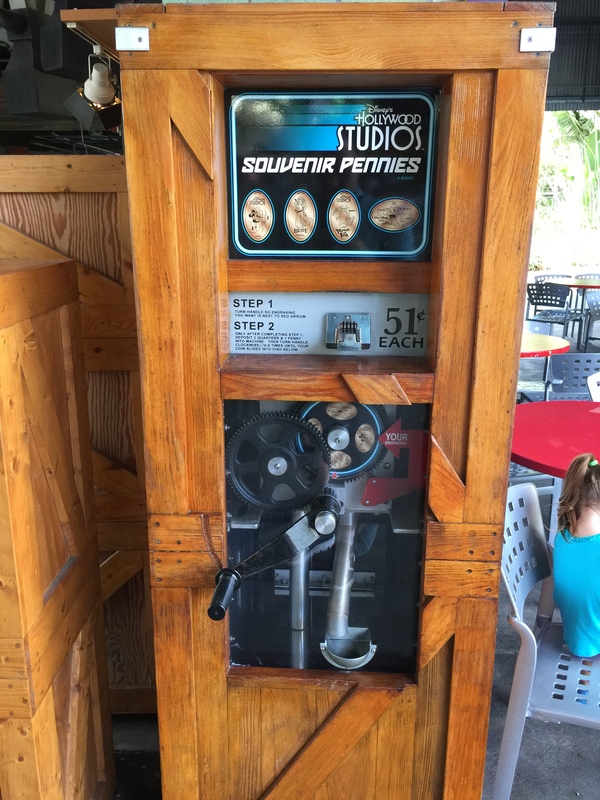 Machine #2 was a hand crank version with 4 designs: Mickey with a Movie Camera, Merida, Agent P, and Buzz Lightyear. 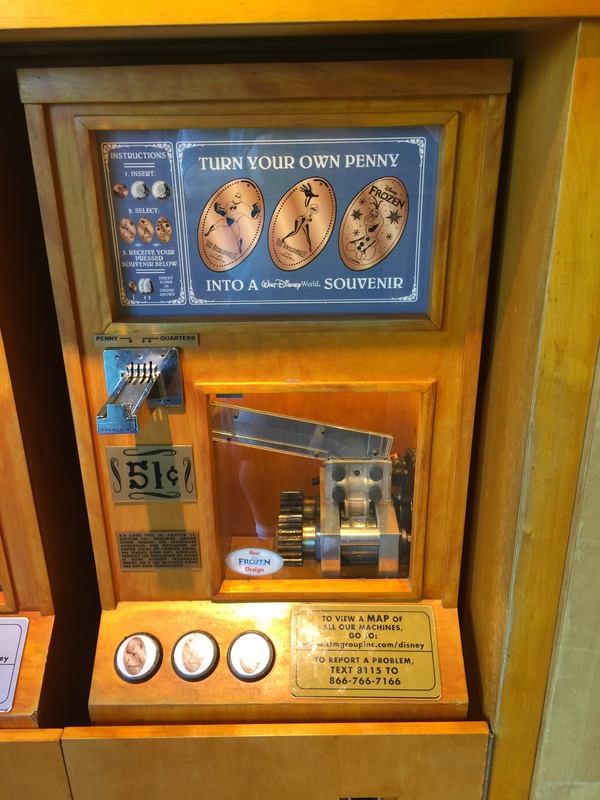 The third machine has 3 penny designs: Anna, Elsa, and Olaf all from Frozen. Speaking of Frozen, by this time is was ready for our Fastpass to see the Frozen Sing-Along Celebration stage show. This was a really cute show, with large screens on the wall for the few people who don’t already know the words to all the songs (shame shame). 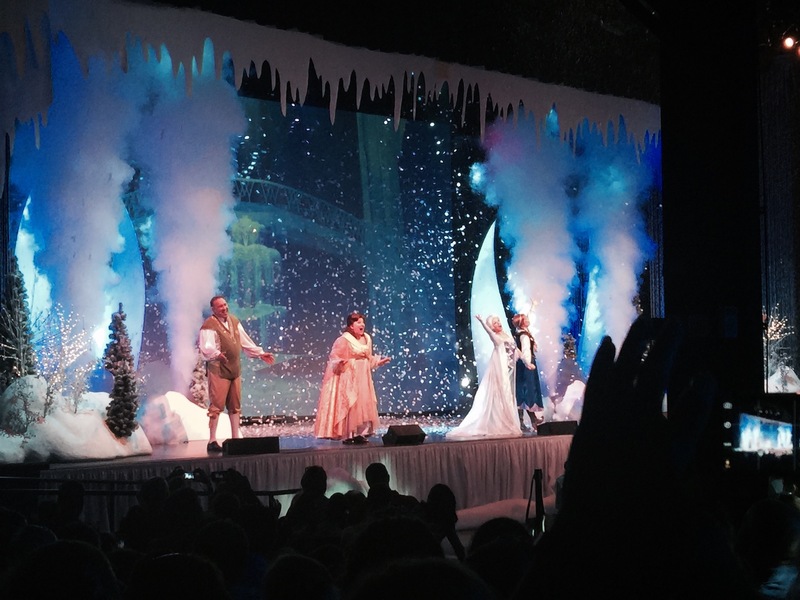 Of course Anna and Elsa make a special appearance to help close out the show. Unfortunately part way through the show Hanna was so exhausted she couldn’t keep her eyes open any longer. Everyone has decided they were ready to head back to our resort for an afternoon rest, but with a few machines still to find I stayed behind with my father who helped me located them. Our first stop was back to the Animation Courtyard, but headed into the Magic of Disney Animation building. This place has recently added a Baymax character meet and greet which was booming when we walked in. 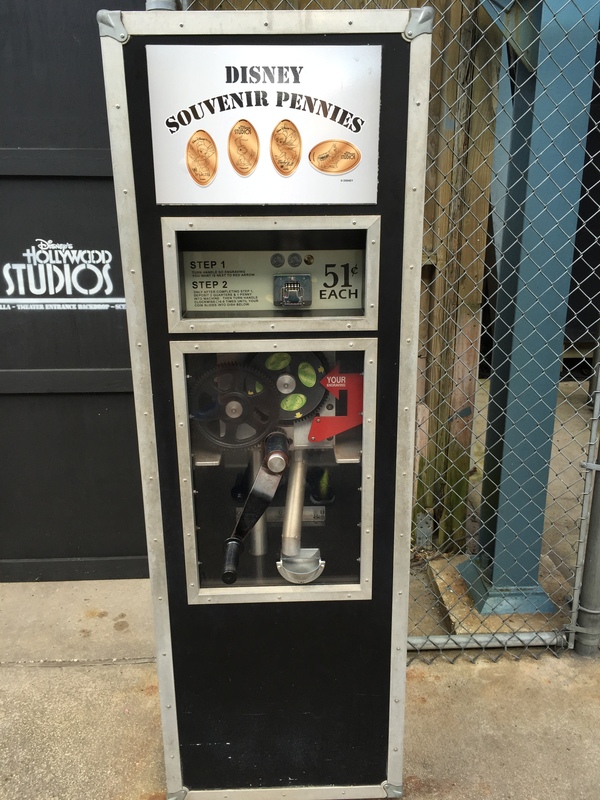 I found the machine near their character meet location and pressed the pennies. This machine has 3 Baymax inspired designs: Baymax, Hiro, and Fred breathing Fire. The crowds seemed to be getting larger in this place so we walked around a bit to check out the artist on hand drawing animation cells, and then headed back outside. Next we headed down towards the Tower of Terror which neither my father or myself were going to attempt, but instead we checked out the Once Upon a Time gift shop. 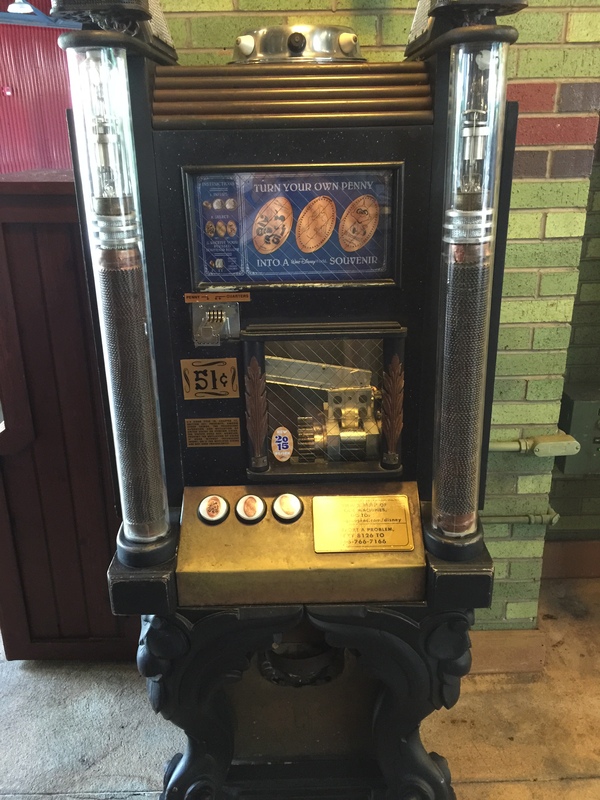 Inside by the side door closes to the Tower of Terror was one of their penny machine. This was another collection update I was doing as I had previously collected these designs but on old coins that wouldn’t clean up despite numerous different attempts. So next best option, press new ones on nice clean pennies. These designs were all about Beauty and the Beast which has a stage show nearby. The 3 designs were: Lumiere & Cogsworth, Belle & Beast, and Mrs. Potts & Chip. We walked out of this store and into the one right next door called Legends of Hollywood. 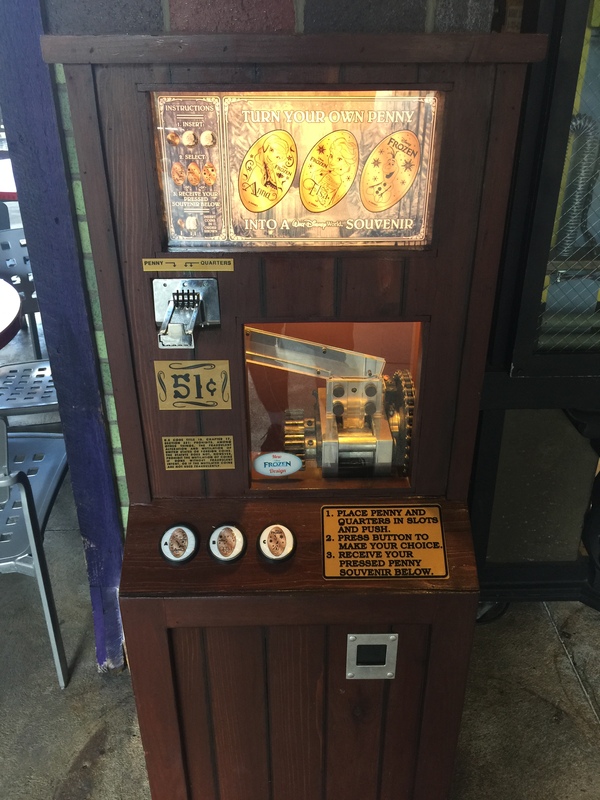 This was a popular machine with 3 Frozen designs. I believe now in total there are 16 Frozen designs throughout the entire property but on this trip I hadn’t seen too many people collecting them. But this machine did have about 3 people using it before it was my turn. The 3 designs included: Anna, Anna & Elsa, and Olaf. There was only one last machine to get, but two places to stop before we left the park. My father is an avid collector of Starbucks mugs. Through his work he has traveled all over the work and started picking up these mugs in each different country and has quite a nice collection. Before we headed on our trip I had read online about the new “Starbucks” locations within the Disney Parks. I used quotes because technically they aren’t labeled as Starbucks. Each of the 4 parks will have a Starbucks location, but when we visited the Animal Kingdom one hadn’t opened yet. The Epcot location didn’t have any mugs available as they had been pulled due to a recall on the mugs about the color of the monorail displayed on the mug. I believe this was because that color monorail had been in a crash that resulted in a casualty. So we had only been able to get the Magic Kingdom mug (he later got the new updated Epcot mug online after we returned home) and were now trying to get the Hollywood Studios version. The “Starbucks” was back on Hollywood Boulevard and labeled as the Trolley Car Cafe. While my dad waited in line for our coffee’s and his mug I ran next door to the Celebrity 5 & 10 Store to use the last machine on my list. 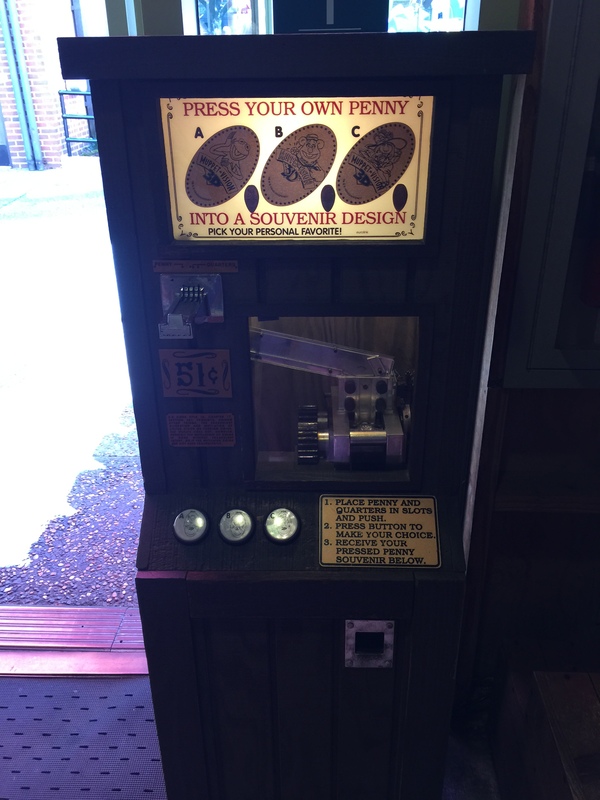 This machine also had 3 penny designs: Roger Rabbit, Lady & Tramp, and Baloo from the Jungle Book. I walked back over to the “Starbucks” just as my dad was finishing up. We took our frappuccinos and headed out of the park towards the bus stop to take us back to our resort. 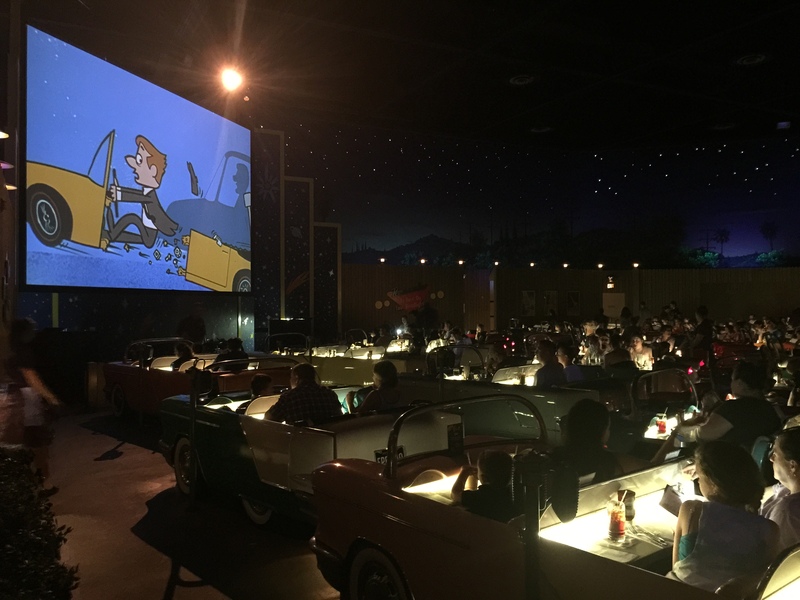 After a nice relaxing afternoon we jumped on the bus back to Hollywood Studios for our diner reservation as the Sci-Fi Dine-In Theater. In all my trips to Disney I’ve never eaten hear and to be honest I’m not sure why. This place was really cool. The food wasn’t overly exciting but was classic diner food like burgers, fries and shakes with some other things mixed in. But the atmosphere was really amazing. You are located indoors, but it looks like your outside at a Drive-In movie theater. We were seated in cars with a little table ledge that didn’t give a lot of room for food and drinks but was manageable. 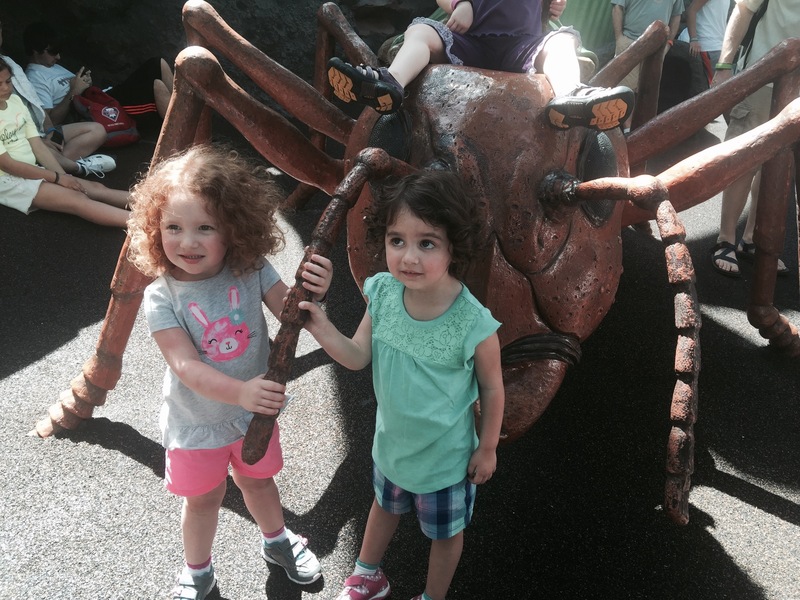 They played classic sci-fi horror movies with little cartoons intermixed for the kids. This really was another unique place to eat and I would recommend it if you haven’t tried it out before. After dinner we walked around a bit just to try to work off the meal a bit. But it had been a long week so far and it was starting to take its toll. We eventually headed back to our resort for a restful night. The next day was our last full day in Florida and we had plans to get a very early start.